Vocal sound perfection is of course the ultimate goal, but in order to provide both the singer and the audience with equally satisfactory experiences, we also strive to continually improve overall music quality. By engineering the speakers to focus and deliver sound to all points evenly we have also succeeded in expanding the audio coverage area, allowing these speakers to be even more effective over a larger area. As you expect with all Yamaha audio equipment, the sleek design and luxurious finish make these a perfect addition to any interior. These are truly the next generation in karaoke speakers. When speakers are mounted in opposite corners of a large room, audio at the center is typically muddled and quite difficult to hear. To avoid this, a 3-way 4 driver has been added to each speaker unit, allowing the speakers to focus and deliver sound to all parts of a room evenly. With Yamaha Speakers you can experience the same audio quality no matter where you are in the room. The main problem with 2way speakers is that they depend on just one tweeter, and must split the vocal audio signal. By adopting a 3way system, the additional tweeter can be dedicated to the vocal channel. This produces a much wider and more dynamic range, and allows for a smoother balance between the midrange vocals and the high and low range background components. 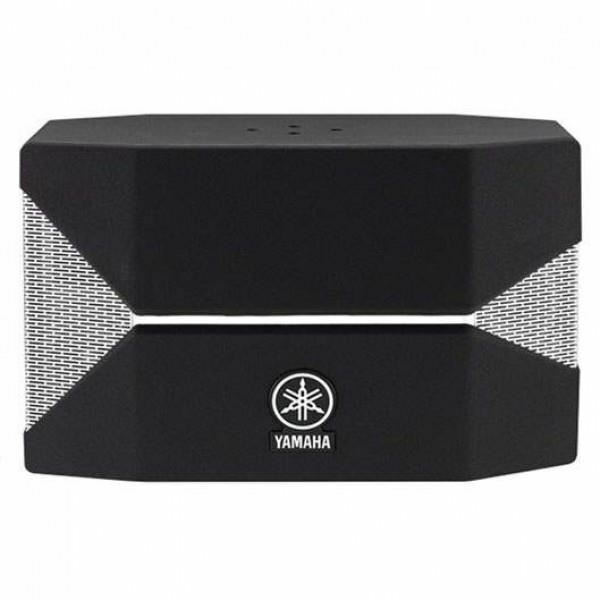 Yamaha's newest technological advance, the Twisted Flare Port, has been incorporated into the karaoke speaker for the first time. Compared to a conventional port, Twisted Flare Ports diffuse the vortex of air generated around the edge of the port, creating a smooth flow of air. This reduces extraneous noise not present in the original input signal and provides clear, accurate low frequency reproduction. Adoption of the three-way speaker system and Twisted Flare Ports has led to a wider frequency response and clearer deep bass sound, providing both singers and listeners with unprecedented comfort and satisfaction. Specifically with the KMS-3100 system, we were only able to achieve this subtle balance after considerable trial and error and a longstanding commitment by the Yamaha engineers to seeking the natural sound quality that singers want. The result is the KMS-3100 system, equipped with the best ever 30-centimeter woofer. Even for professional singers who demand the highest vocal quality, these speakers provide a width and depth of sound that has never been experienced with a karaoke speaker. That is, in other words, an audio experience of unparalleled luxury and enjoyment. Yamaha TF5 Digital MixerHigh input capacity and fader count makes this powerful console ideal for larger applications.33 motor faders (32 channels + 1 master)48 input mixing channels (40 mono + 2 stereo + 2 return)20 Aux (8 mono + 6 stereo) + Stereo + Sub buses8 DCA groups with Roll-out32 analog XLR..